Happy Free 2016 Bike Map New Year!!! Via streetsblog.org, reportedly the free 2016 New York City Bike Map which you can either download as a pdf now, get a paper one mailed to you by calling 311, or stop by your favorite NYC bike shop to pick up a paper copy, will be available in print shortly. As reported by the Gothamist, and other news outlets, just before 5:40 PM on Tuesday 2/16/2016, 59 year old avid cyclist, Stanley “Lee” Marshall, was struck and killed as he was biking on Richmond Road (at the intersection of Andrews Avenue), in Staten Island. Forget #visionzero how about zero clothing. Yesterday (6/13/14) was a subdued World Naked Bike Ride in NYC. Here is a full frontal report form Time’s Up Ben Shepard. An article about this past Sunday, 8th annual memorial ride. 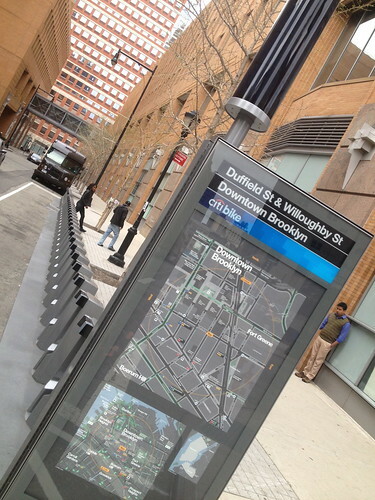 This has been a stellar week for NYC’s very anticipated bike sharing, sponsored by Citibank and due to kick off in May. Here is a nice big one I found in the Fulton Mall on Willoughby St, near a couple of Downtown Brooklyn hotels. 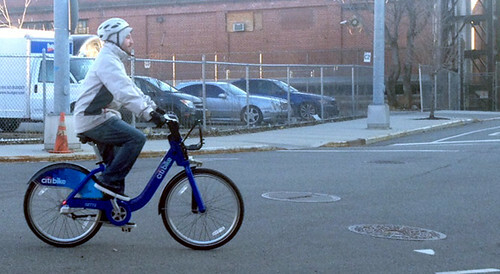 With Citi Bike set to launch later this spring, the long wait for bike-share in New York City is almost over. But I couldn’t bring myself to wait an instant longer, so recently I headed over to the Brooklyn Navy Yard to try out some Citi Bikes. A small network of bike-share stations has been operating for the past few months in the Navy Yard, where people who work inside the walls can try out the system, checking out bikes using the same key fobs that annual subscribers will get once Citi Bike launches. I was able to borrow one of the fobs and go for a test spin on a frigid morning in March. 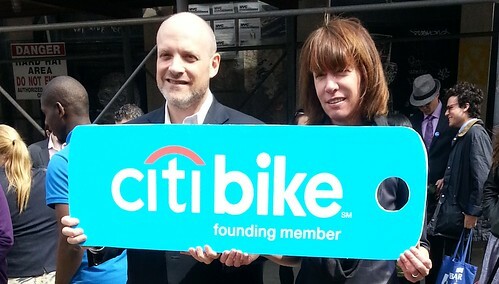 Streetsblog reporter Stephen Miller reported that NYC Deputy Mayor, Howard Wolfson (twitter: @howiewolf) and Transportation Commissioner Janette Sadik-Kahn, launched the official sign up to the citibike program where people can go on line and register for annual memberships. In 2009, the Department of City Planning released an ambitious blueprint for bike-share in New York, and in 2011, the Department of Transportation began an extensive public process to site actual bike-share stations. Now the planning is giving way to implementation, with North America’s largest year-round bike-share system set to launch in May. 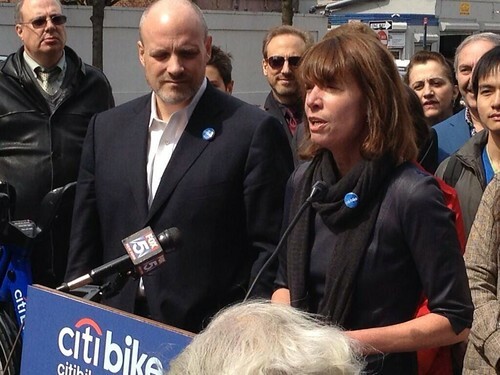 Today, Transportation Commissioner Janette Sadik-Khan and Deputy Mayor Howard Wolfson marked an important milestone: New Yorkers can now sign up for annual bike-share memberships. Annual membership sign-ups have been open since early this morning, and more than 2,500 people have already subscribed at the rate of about $103 per year (including tax), which entitles users to unlimited rides up to 45 minutes long. so I signed up, citibikenyc.com/signup for a $103.00 fee and got my annual membership. I think the biggest fool’s day event was the very successful run of the @bronxzooscobra on twitter. Oh well, now that the 20″ Egyptian cobra is safely back in her tank and not gallivanting all over the city, somehow will have to find a way to get on with our lives.